Former John Tyler High School and University of Houston standout Greg Ward Jr. hauls in a reception for his new team, the San Antonio Commanders during Saturday's game at the Alamodome in San Antonio. The former John Tyler Lion hauled in a 37-yard pass for the biggest play of the first half. SAN ANTONIO, Texas — John Tyler alum Greg Ward Jr. made a strong first impression in his Alliance of American Football debut Saturday night. Ward, a wide receiver for the San Antonio Commanders, hauled in a 37-yard pass from quarterback Logan Woodside. 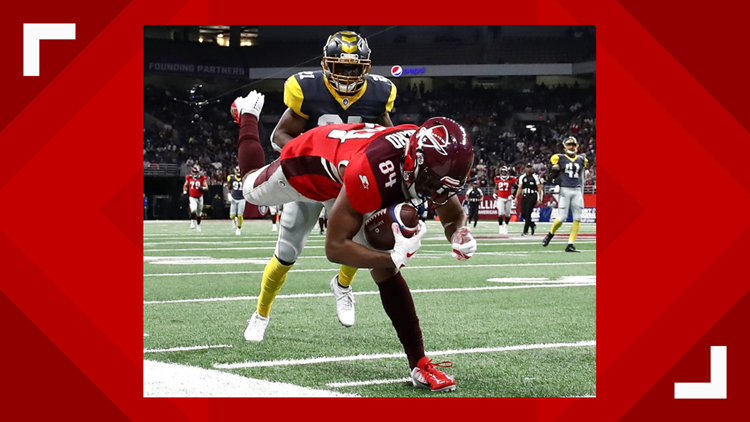 The Commanders came away with the 15-9 victory over the San Diego Fleet in front of nearly 28,000 fans at the Alamodome. Next up, San Antonio will face head coach Steve Spurrier and the Orlando Apollos on Sunday, February 17, at 3 p.m back in San Antonio. The contest will air live on CBS Sports Network. Tickets are available here.